I was having a perfectly good weekend, when I noticed something strange yesterday. It must have been very strange because I’m wearing my mad face today. As you can see. Have you ever heard of anyone cutting down a perfectly good old, majestic, shade-producing tree just because they don’t like it? Rest in peace Mr. Tree. 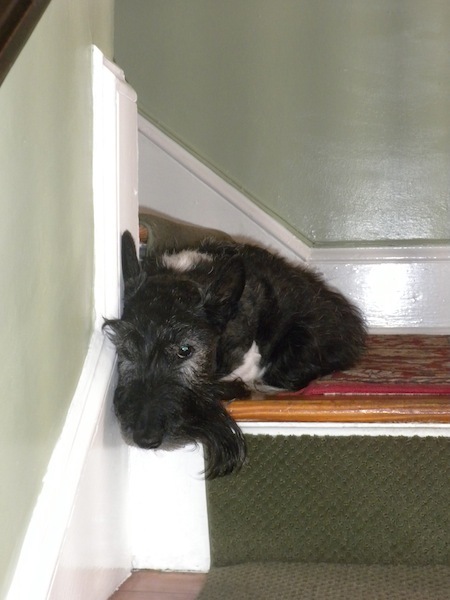 This entry was posted in The Scottie Chronicles and tagged climate control, ecology, nature, Scotties, trees. Bookmark the permalink. Oh noooo! That is terrible. Our Mom LOVES trees. We don’t understand why people do this unless the tree is sick. The poor animals/birds that rely on it for food and shelter must really be upset. I bet it has a lot of peemail on it also. It takes three trees per peep for the Carbon Dioxide- Oxygen Cycle. We have three big trees on our property. When our neighbor took down his gorgeous oak tree because he did not like raking leaves we told him not the breathe the oxygen our trees were making and not to sit in our shade. Goodness, this is a very sad thing to hear. If it was old and diseased beyond help or if it were slowly falling to one side putting homes and people in jeopardy, well, that we could understand. 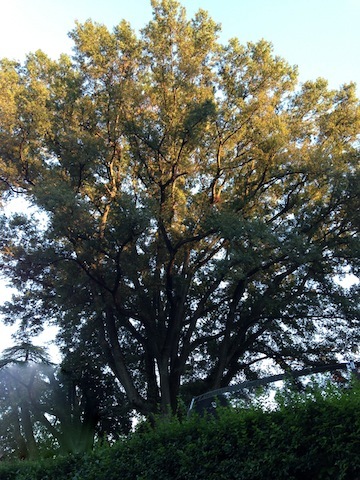 But to take a big, old beautiful tree that provides shelter for birds, shade in the hot summer and enjoyment for all to see with its fall foliage or snow-laden limbs in winter is just inexcusable! the tree is beautiful! i agree with you. Crap Stuart! What’s up with these clearly brain damaged heathens? We had some naybors do dat to a perfectly good live oak – just nutso. soooo sad Stuart; did your peep ask them why??? you should find out. that is nothing shot of tree murder – don’t they know tree make oxygen ! Growing up in West TX where there aren’t many trees my peepstress loves and values trees greatly. However, we did have to take down a beautiful tree in San Antonio because it was diseased. It was so bad that it would have fallen into either the electrical wires or our house. It’s amazing how peeps want to make the world into strip malls. How sad..yes, we also have had neighbors ‘murder’ beautiful trees… 9 – 80 ft pines..caused horrid mud slides into our pool and yard. Cost us thousands to fix the damage …plus privacy was gone. And had to put in a new pool liner. We were sad for the birds chippers and squirrels…and our little bank account. Sorry for the tree and all the beauty he shared with y’all. That’s just terrible! It really hurts our environment, not to mention the scenery. People should be made accountable for cutting a tree down nowadays! They should have to get permission from the city or environmental agency or something, not just irresponsibly go cutting trees down! They should have to prove why it would better the environment to cut down a gorgeous creation like that. We’re so sorry, Stu! We’re very hurt! This make my heart hurt for that lovely tree. Why do people have to be so heartless.